How relevant is a passenger’s academic title? 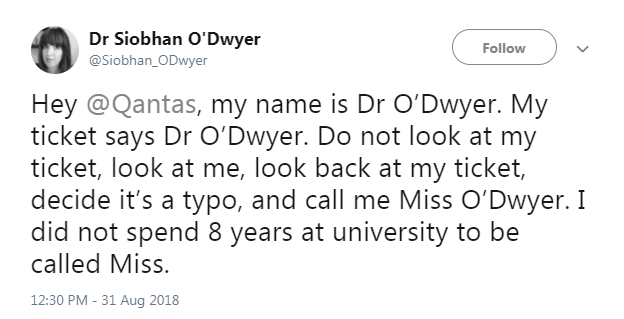 This was so important to Dr. O’Dwyer that she tweeted: "Do not look at my ticket, look at me, look back at my ticket, decide it’s a typo, and call me Miss O’Dwyer. I did not spend 8 years at university to be called Miss." One may expect a more coherent text from a Dr. How can a Qantas employee not look at her ticket and then look back at her ticket? We decided to ask the opinion of a person who has contributed to this website before. He (sorry!) holds 2 doctorates: an earned doctorate obtained through a dissertation and an honorary doctors degree (doctor honoris causa), so he should know. His response follows. First, he wonders why Miss O'Dwyer believes her name is Dr. O'Dwyer. Did she officially change her name of Siobhan O'Dwyer into Dr. Siobhan O'Dwyer? Second, why is de scholarly title Dr on her ticket anyway? What is the relationship between the ticket and science? She might be a frequent flyer on Qantas and if so, she will undoubtedly have added the title Dr to her profile. This may explain why it is on her ticket. Third, what is wrong with calling someone Miss? She might be married, but if so she does not make the impression to appreciate the right to use her husband's name or to be called Mrs.
Fourth, most academics I know hardly use their Dr titles as they consider it in most instances irrelevant. 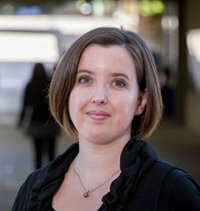 Dr. O’Dwyer suggests she spent 8 years at university to be called Dr. That seems quite unique as virtually all Drs I know spent time at the university to learn. Fifth, she does not demonstrate a scholarly attitude by jumping to the conclusion that the flight attendant decided that Dr on her ticket was a typo. There are also other possibilities, for example the title was considered irrelevant (for good reasons). Sixth, in response to criticism on Twitter she tweeted: “This was not about my ego. It was about highlighting one of a thousand instances of sexism that women encounter every day. It’s not about the title, it’s about the fact that this wouldn’t have happened if I was a man.” It seems a habit of hers to present an assumption as a fact. Obviously, she felt the need to deny it was about her ego. However, her reference to sexism seems far-fetched. Suppose that a flight attendant would call a male passenger with Dr on his ticket Mr. Would he complain?